Further to my telephone conversation to your office on Tuesday 19th September and your return call, I am writing to record that you have agreed to replace one of the French doors that were fitted as we had actually ordered “passive” locking doors with two gold handles on the inside and unfortunately this was not supplied. However, I would like to say that we were extremely pleased with the job as a whole, the doors/windows look very good and the fitter installed them in a very clean and tidy manner. I would have no hesitation in recommending your company. Thanking you for your assistance and I look forward to hearing from you when the door is ready to be replaced. My windows were replaced at the end of July so I do apologise for not writing sooner to say what a lovely job Matthew and Philip did. I should like to mention that it was a pleasure having them working in my home, they were always very helpful and polite. My wife and I would like to thank everyone at Trade Window Services Ltd for the exceptional levels of service shown, and demonstrated to us by all concerned during the supply and fitting of the windows and doors to our premises. I would further add that we would have no hesitation whatsoever in wholeheartedly recommending your company to anyone that was looking to engage you in any capacity. Please find enclosed our outstanding balance of £3,150 regarding supply and fitting of doors to the above premises. Thanks for my new door and service been provided from your company, which is very good. I am very pleased with it. Thanks again. Just a note to say how please we are with the result of the windows. Also thanks Richard for his good workmanship and finishing touches. Our neighbour was so impressed she is having her windows done by you! So it was obviously done well. 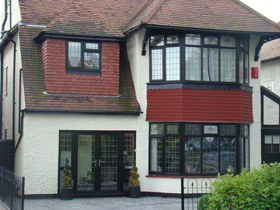 Thank you for the wonderful workmanship of our windows and conservatory. We are very happy with it. You men have been most helpful, kind, considerate and very tidy. The conservatory has transformed our kitchen into a wow factor. I recently had all of my windows and doors replaced by yourselves, and would like to express my satisfaction over the way it was handled from beginning to end. My initial consultation with Barry was excellent as was the surveyor. I was most impressed with the match on the brickwork as they no longer manufacture this type. Phil and Matthew, the fitters, were absolutely fantastic, nothing was too much trouble for them, and I felt totally comfortable leaving them in my home while I went to work. They are a credit to your company with a very courteous and professional approach. Many people have commented on the quality of the windows and workmanship so far, and I have obviously passed on your details and will continue to do so. Please find enclosed a cheque for £4500 being full payment for the supply and fitting of windows and doors to the house on St. Helens Road, Westcliff. We look forward to doing business with you again in the future. 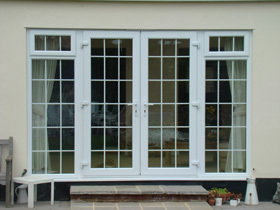 We write to advise that we have been very satisfied with the French doors that you fitted to our office. We bring to your attention the particular care and attention your fitter paid to the detail and finish whilst working on the fitting. 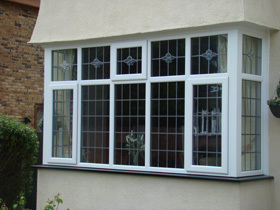 Should we be asked to recommend any window/door suppliers, we will pass on your details without hesitation. Thank you for your guys and windows. They have done a superb job, we are totally delighted. Matthew and Phil are a credit to your business. Please find enclosed settlement for the 3 property addresses. I realise we have added a small additional window, please invoice when complete. P.S. I will be in touch in a few weeks to sort my personal windows.